It was not a difficult decision for Craig Donaldson when he was approached to help launch Metro Bank in the UK. Before becoming its chief executive he was working at the scandal-beset Royal Bank of Scotland. Donaldson recalls hosting an RBS lunch for people who had done more than 35 years at the bank – which was fined £430 million by US authorities last week for its role in a foreign exchange rigging scandal. ‘I was talking to a chap who had risen up to be store manager in his patch. We had just had all of the bad news and he started crying. I asked him where his wife was and he said “She’s too upset to come”. I said: “I’m really sorry, how has it been on the front line?” and he said: “I was spat at this morning. I’ve worked there for years and I was spat at this morning”. ‘Now I’m not saying RBS didn’t do anything wrong. But the individual had done nothing wrong. He’d started as a junior in the store, he’d gone through the ranks, he’d done 37 years, and he was just about to retire and he had £532,000 worth of shares about eight months earlier, and on the day I was talking to him it was worth £37,000. He points out of the window of his offices above Metro Bank’s first branch in Holborn, to the London streets below. ‘It’s amazing how busy this is at 3 in the morning. I’ve seen it,’ he says. 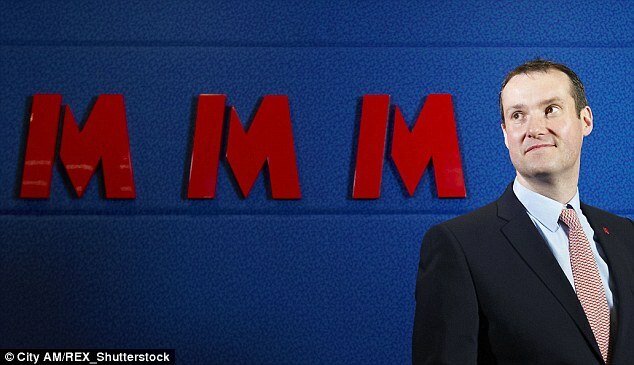 Metro Bank has raised £680 million from investors. Donaldson jokes: ‘I like to say a billion dollars, just because it sounds better. ‘We are now 34 stores. I’ve got another six being built and I’ve got another one starting build next month. So we’ll be 41 stores by the year-end. We have about £3.5 billion in deposits, between £1.5 billion and £2 billion in lending, and we have about 1,800 colleagues. ‘It’s a pretty good story and I’m actually very proud of it.’ He insists a key to Metro is its focus on service and convenience and transparency. 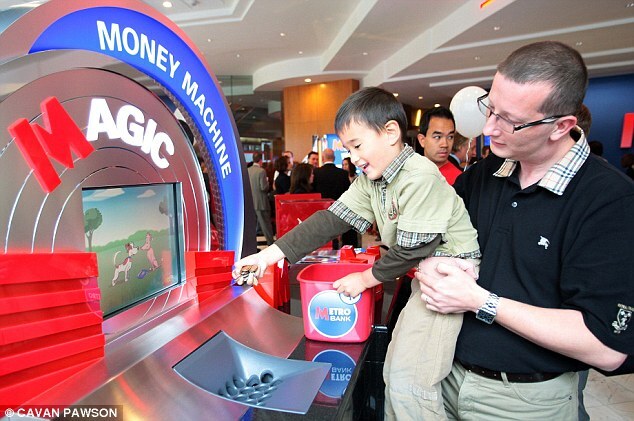 The bank introduced baby-changing facilities on the recommendation of his wife and has installed its ‘Magic Money’ change machines. But in this digital era, why such a focus on branches, or stores as Metro Bank prefers to call them? ‘If you make the stores a tangible delivery area, then you do want them. Donaldson has ambitious plans, but the City has been waiting for a public share sale from Metro for a few years and so far it has not materialised. That could finally come next year. Metro Bank was founded by American banking entrepreneur Vernon Hill who previously set up Commerce Bank in the US. They have good reason to hope they can repeat its success. Having opened his first branch in 1973 Hill eventually sold the bank for £5.5 billion. A key aim for Metro was to be a significant player in small business banking and such firms account for just under ten percent of its customers, but about half of all its deposits and lending. ‘It’s dreadful what goes on in the SME market. It is so concentrated and SMEs need a better deal in my view, and that’s what we’re trying to do. So we are challenging a lot of the traditionals. We have never cut the interest rate on an existing customer in a variable account. We’ve never done it. Do you know the regulator lets banks cut the rate of up to half of one per cent a year on customers without telling them? Donaldson warms to his indignant theme. ‘We did some research, and out of the top ten banks every single one had cut rates on its customers. They’d taken nearly half a per cent off the customers without telling them. The Competition and Markets Authority is in the midst of a probe of the small business and current account markets among the banks and Donaldson is more than willing to give them his views. ‘It’s not about upsetting other banks. I want to be proud of the industry I work in. I will only be proud if we do the right thing. ‘There’s good income and bad income and if customers don’t know you’re taking that income from them: that’s bad. Good income is where you’re working with your customers, you’re delivering a service to your customers and they’re paying you for it in a transparent and open way.